I have successfully mastered liquid soapmaking using both the water method and the glycerin method. Each method has its pros and cons - each relating to time, cost and mess. I want a liquid soapmaking process that is inexpensive, quick and easy with little mess. The water method is cheap and distilled water is readily available at your local grocery or drug store. Glycerin is more expensive and not as easy to come by plus you need to take into account shipping charges if those are incurred for online or phone ordering from any of the various suppliers of soap making ingredients. Point Water. The water method can be a very long and drawn out process. From the time it takes to get your soap to trace to the extended cook times plus having to watch and stir every 30 minutes. If anyone has made a 100% olive oil liquid soap from scratch, you know how looooong it takes for that formulation to trace and not separate out. The glycerin method is much quicker in that your soap will come to trace within 15 minutes or so. Just like with the water method, some formulations trace quicker than others. Point Glycerin. I find that diluting paste created from the glycerin method is much quicker than diluting paste created from the water method. Another time saving feature. Point Glycerin. The one drawback to the glycerin method that is not found in the water method is the way in which you must dissolve your potassium hydroxide. Your glycerin must be heated to over 200 degrees F in a stainless steel pot in order for your KOH to dissolve. I have had my glycerin reach over 300 degrees as it continues to heat as I add the KOH - a little worrisome for safety. Point Water. ETA: I now add my KOH directly to my glycerin prior to heating and then heat both of them together on very low. No bubbling up of the ingredients as room temperature KOH hits the heated glycerin - much safer. So, the best method I have found for creating liquid soap is to combine these two methods for a process that is quick, easy, safer and less messy than I find the glycerin method to be. I call it the 50/50 method. 50% of your liquid is distilled water, the other 50% is glycerin. Soap traces fast, does not need a long cook time and no heating of the glycerin to a high temperature. 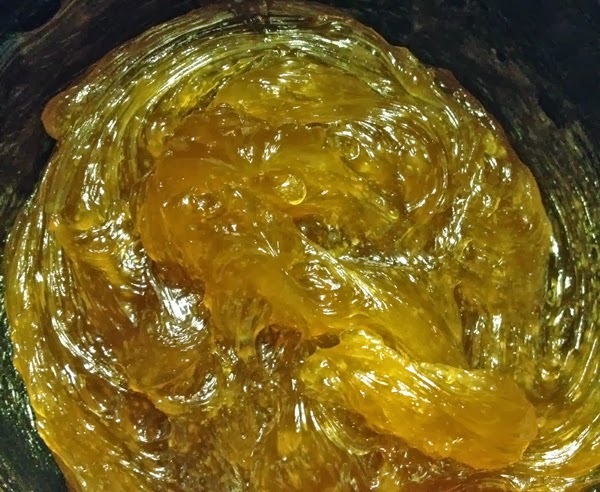 The benefits of the glycerin method without the mess. You can also adjust these ratios to fit your needs as long as you use enough water to dissolve your KOH. My rule of thumb is the minimum amount of water to be 1.1 x KOH. So if I need 4 ounces KOH, the minimum amount of water I would use to dissolve it would be 4.4 ounces distilled water. I use the following formula for this tutorial. As usual, make sure to have all your safety equipment and gear. Please use all safety precautions including wearing eye and hand protection, long sleeves, long pants and closed toed shoes. Both Sodium Hydroxide and Potassium Hydroxide are caustic materials which will burn if they come into contact with your skin or eyes and can do some serious damage. Not something to scare you away, but always take appropriate safety measures when making soap from scratch. Gather all your soap making equipment (crock pot, stick blender, mixing utensils, phenolphthalein drops, etc.) The assumption here is that you have some experience in liquid soapmaking already. 1. Measure out your oils and heat in a crock pot. 2. Measure out your distilled water in heat proof container, your potassium hydroxide and your glycerin - all in separate and appropriate containers OR you can add your glycerin directly to your oils. 3. Slowly add your potassium hydroxide in small amounts to the distilled water mixing between additions. 4. Continue to mix until your KOH/water solution is clear. 5. If you did not add your glycerin to your oils, you can slowly add it to your KOH/water. 6. Add your water/glycerin/KOH or water/KOH mixture to your heated oils in the crock pot and stick blend. 7. 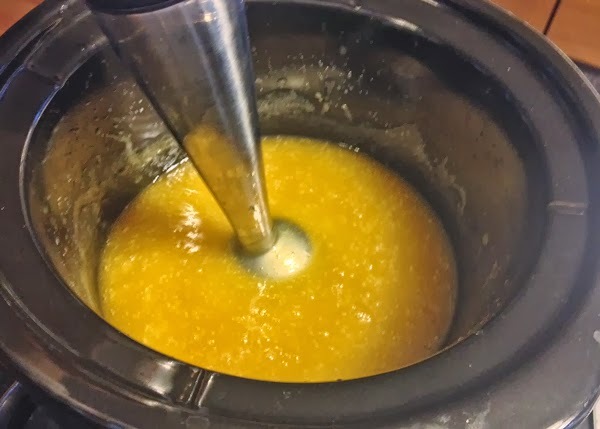 With this formulation you will see it start to thicken within a few minutes and go to a glossy paste (not translucent) within 15 minutes - this is very dependent on the oils you used. 14 minutes from the time I start stick blending until I have reached a point that I can test my paste and start cooking if necessary. Normally this formula would take 45 minutes to a hour or so to get to this point using all water due to the high olive oil content in the formulation. I also know that since this formula above is mostly olive oil, I do not expect it to get to the taffy stage as I have never had a high olive oil formula get to that stage. 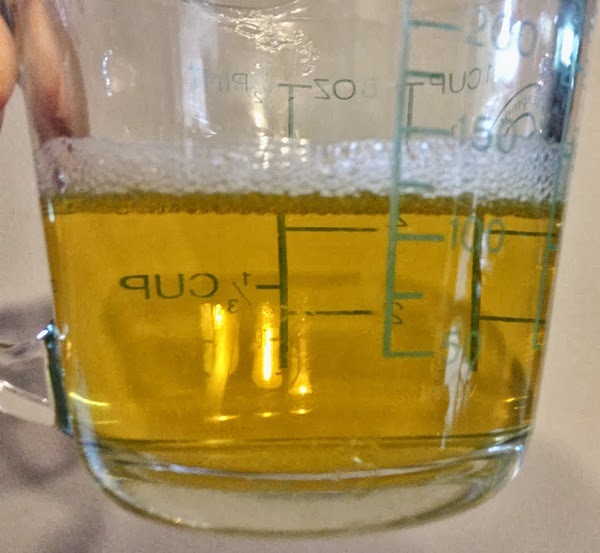 at this point, a sample (a small amount of soap paste diluted into a small amount of distilled water - see below) tests clear with a quickly measured Ph of 9.6/9.7 (not completely accurate as it is not cooled nor highly diluted, but a good quick indicator for me - 8 minutes. 9. At the 14/15 minutes point I test the paste with the phenolphthalein drops. Test is clear but after a few minutes it gets a medium pink ring around the dollop of paste. This is considered good. No excess KOH and an acceptable pH level when a sample of diluted soap is tested at room temperature. Phenolphthalein drops are a pH indicator to determine if and or how basic your solution/soap is, they cannot accurately tell you the pH of your soap/soap paste only whether you have excess lye remaining in your paste which will affect the overall pH thus rendering a darker shade of pink. They are a good tool to use when making your paste along with a clarity test. Clear soap can still have excess lye in it. The most accurate way to do this is via titration. Some people prefer the zap test (touching cooled soap paste to your tongue and if you get a zap like a 9V battery, you still have excess lye present), others do not. 10. Heat of a few ounces of distilled water and add an ounce of paste. Tests clear. pH reading with my digital ph meter registers at 9.7/9.8. A bit higher than I like but still acceptable for liquid soap. I also find that the pH often continues to stabilize as the soap sequesters - this is mostly due to testing conditions though. If testing in a more concentrated sample or on not at room temperature, your readings will be affected. 11. 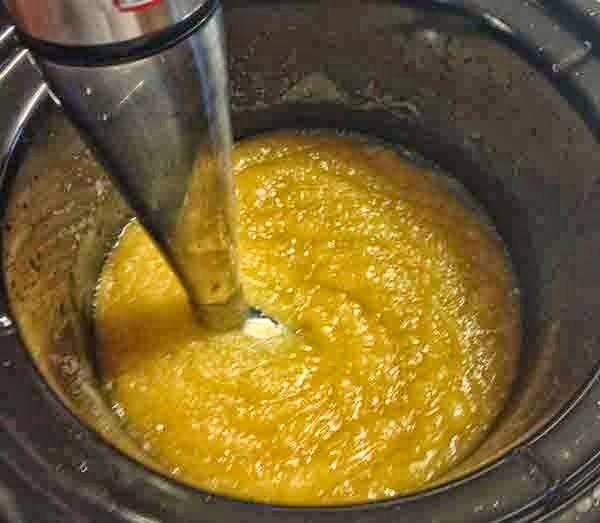 At this point, your paste is considered done and you can turn off your crock pot and let your paste sit for 12 - 24 hours and to finish the process. 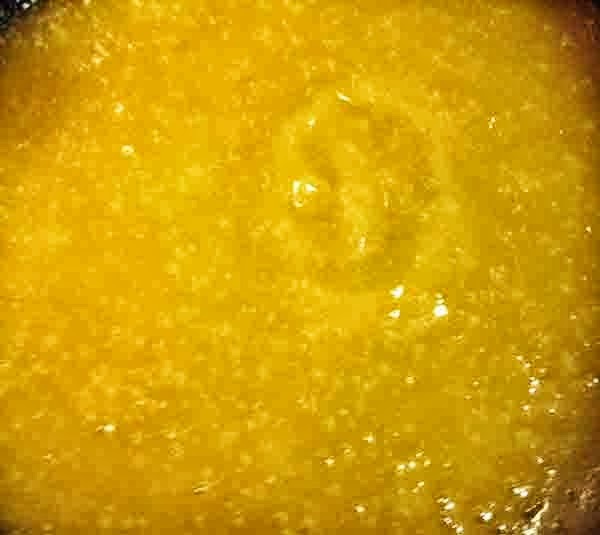 While fluid while hot, the paste oftentimes will harden up as it cools. Some pastes stay somewhat fluid - each formulation will act a bit different. I prefer to cook it a bit longer to make sure that all parts of the paste are thoroughly cooked through. I will cook for another 2 - 3 hours or so, mixing and testing the paste with the phenolphthalein drops every 30 minutes. Then I will turn off the crock pot and let it cool down for the next 12 - 24 hours. 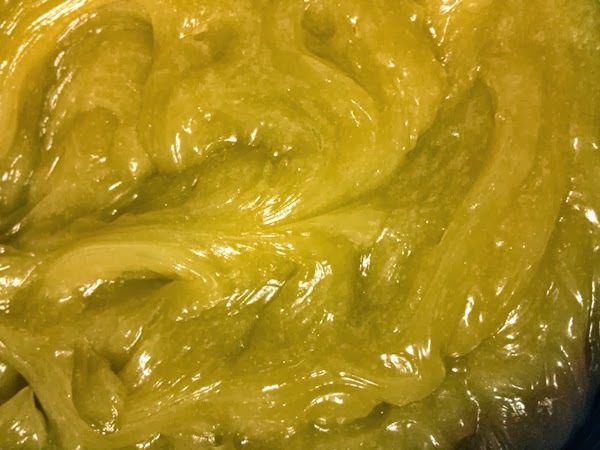 You can cook your soap longer if you would like, you can "cold process it" too - I find that everyone has their own preferences for how long to cook or not cook their soap paste. After 2 hour cook and sitting in the crock pot to cool (about 12 hours from start to finish). Paste will harden if left to sit longer. 12. Dilute, adjust ph/neutralize if necessary and thicken how you normally would finish your liquid soap. I am going to use my HEC method 2 (thicken while you dilute) to thicken and dilute this paste at the same time since I know what my dilution rate is going to be. It has a current ph of about 9.2 in a concentrated sample which is fine for me so I will not be adjusting it at all. How you dilute, your desired viscosity and your desired soap concentration (the less dilution water the more concentrated your soap, the more dilution water the less concentrated your soap) are all personal preferences. 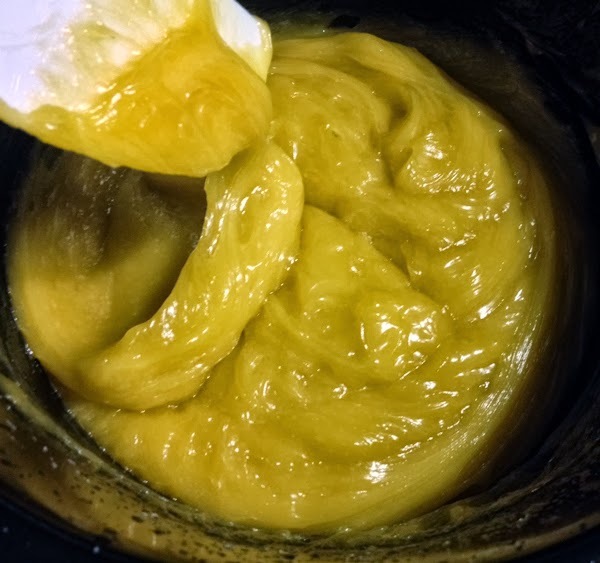 Some people prefer to use as little dilution water as possible to dilute their paste to get a thicker viscosity, but, one must also take into consideration how concentrated the finished soap will be. BrambleBerry - Base Oils, Fragrance and Essential Oils, Potassium Hydroxide, Lye Calculator and a whole ton of great information on their blog. You can also start with one of their pre-made soap pastes to get a feel for dilution before jumping into the whole process. Copyright 2006 - 2015 Alaiyna B. Designs/Alaiyna B. Bath and Body. All rights reserved. All text and images are the property of Alaiyna B. Designs/Alaiyna B. Bath and Body. No part of this document or webpage may be reproduced by any means without prior written consent of Alaiyna B. Designs/Alaiyna B. Bath and Body. Can't wait to try this method! The paste is absolutely beautiful! How do you color the soap and with what? I color liquid soap with liquid dyes. I use the low pH Labcolors from Brambleberry (https://www.brambleberry.com/LabColors-C173.aspx - sounds strange as liquid soap is a high pH product, but you color after saponification not before so there is no worry about colors mutating on you. Not exactly sure why they are called low pH dyes as they are also ones you would use for melt and pour soap which is also a high pH finished product but also has already gone through saponification before you work with it.) I am sure other liquid dyes work well too I just have not tried any others. Any powder color (mica, oxides) will end up settling to the bottom and not give you the overall color you are looking to achieve. Good luck. My clarity test resulted a white-y saturated liquid. The destilled waiter becomes white when i mix the paste with it. Is it okay or what? What should i do? This really depends on the oils/butters used in your formulation. If you have used those that lend itself to a clear soap, then a milky test sample means that you need to cook the paste longer. I tried this method from a gel recipe I found in Catherine failor's book. She recommends using a lye excess but I'm having a tough time titrating to an acceptable pH. Do you disagree with her when she says that superfatting a recipe is subject to having the excess oils go rancid? Yes, I do believe that too much of a superfat can lead to the unsaponfied oils going rancid over time. Remember it is not the pH you need to worry about as liquid soap will always have an alkaline pH, it is any excess lye present that could cause your soap to be caustic. When you formulate with a lye excess, you are ensuring that all your oils are saponfied so there will be no extra oils remaining. However, keep in mind that when you neutralize with citric acid, you are giving that excess lye something to react with so that it is no longer present in your soap. 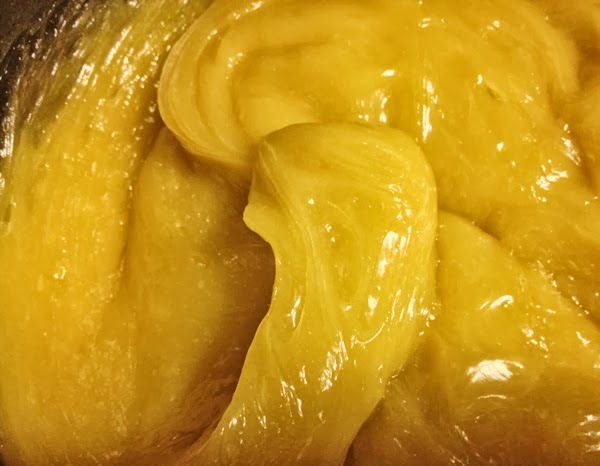 If you use too much of a citric acid solution, you end up releasing fatty acids into your soap as the acid continues to react with your finished soap and you are then in a similar situation as if you did too high a superfat to start with - hope that makes sense. Is it possible to make liquid soap using Sodium Hydroxide for saponification? Some people have been successful using sodium hydroxide making liquid soap with all soft oils, but over time the soap will most likely start to crystalize (that is why NaOH is used for hard bars - the crystallization creates a solid product) and give you hard or lumpy bits and pieces in your soap.